The group of wealthy supporters considering a takeover of Manchester United say they will not overpay for the football club. The so-called "Red Knights" said they would only pay a "fair price", although they have not said what that might be. The Times newspaper reported on Friday that 60 investors had pledged up to £1.5bn ($2.26bn) to buy the business. But a statement from the Red Knights said that figure was purely speculative - and no specific talks had been held. The Red Knights includes the former Football League chairman Keith Harris and Goldman Sachs chief economist Jim O'Neill. "No specific discussions have been held in relation to the value of Manchester United," the group said. "People are talking about putting their own money in and are only going to do so if it's at a fair and reasonable price." It added: "Every penny over a fair price that goes to the Glazers in profit is less money that could be spent on putting the club on a sound financial footing after any takeover." US sports tycoon Malcolm Glazer, who bought Manchester United for £800m in 2005, said the club was not for sale. His ownership is unpopular with many fans who dislike the high level of debt he has brought to the club. 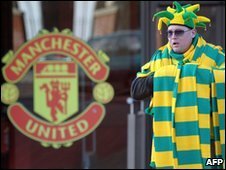 Some fans have begun wearing green and gold colours, instead of the traditional red, to show their support for potential new owners. Manchester United this week reported a small reduction in the its debt burden at the end of last year. The club said its gross debt was £507.5m in the last three months of 2009, compared with £538.1m in the same period the year before. Pre-tax profits for the quarter were £6.9m, compared with a loss of £2.7m in the same period in 2008.